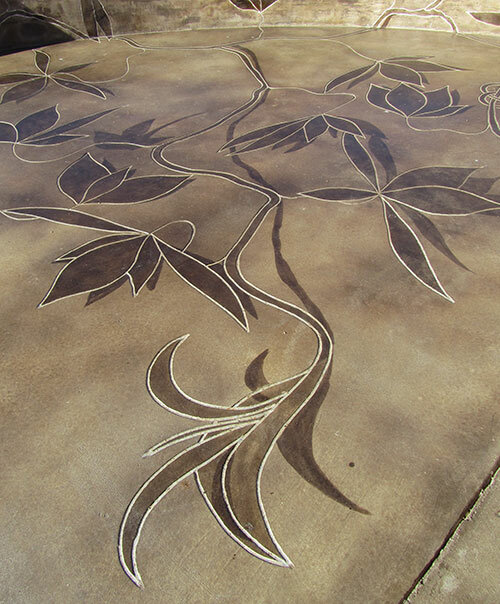 As an artist working with decorative concrete, I find myself working on unique outdoor designs more often than interior ones. Because of this I tend to use acid stains more than any other type of stain. I am always worried about longevity with my work, and I feel that acid stain will outlast any other current product on the market. When working with acid stain I enjoy the challenge of layering colors when you have one shot at it and a limited color palette. Although I am very limited in color choices, I feel I am able to achieve more color variations than clients expect. As with any of my clients, when I sat down with Leo White of Mt. 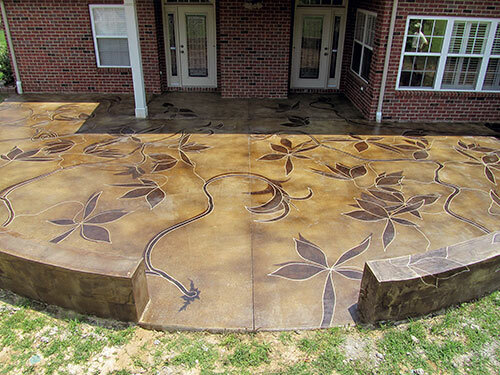 Juliet, Tenn., about designing his back patio, I wanted to find a design that intrigued him. When I first entered Mr. White’s house I noticed that his décor incorporated numerous images of different types of leaves or vines. He had multiple paintings that were just close-ups of leaves. I was immediately drawn to one image of an ivy-like leaf pattern that I thought would make a unique design. After pointing out the image and idea I turned to see a very surprised stare. White knew right away that I was the artist he was looking for. Next we had to discuss the layout of the concrete. I rarely get to be a part of the actual concrete layout. Many times I deal with an existing space. I brought in Joe Drake (a Mt. Juliet resident who pours all my concrete and does all my overlays) to help facilitate my design ideas. When he does an antique rub, Joe creates a surface that has a sandpaper-like finish. He goes back over the surface with a special trowel and rubs it to make it look weathered. He waits until just the right moment and rubs the surface to rough it up. Within the next week Joe came back out to the space and built two sitting walls out of cinder block. Concerned about changing weather conditions, we waited until the concrete was cured before Joe overlaid the surfaces of the walls with H&C’s Dual Component Texture. This way, the overlay would not get abused by weather during the curing period. I came in the next day to start my design. When I do designs of this caliber I have to make sure every little detail is planned out perfectly when it comes to color. Do I stain first or do I design first? On this particular project I designed first and stained second. Adding overlay to the sitting walls created another level of difficulty for this project. 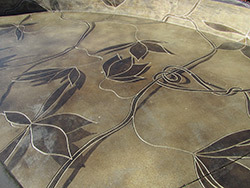 We had to match colors and textures between an existing slab, a new pour, and an overlay on a vertical. It is hard enough between two pours. Overlays tend to be more white than regular concrete, or a different grey. They tend to either take acid stain too well or barely stain at all. Laying out the design was entertaining. One important point I learned in art school is to think about a composition as a whole and not just start on one side and work your way across the space. The easiest way to accomplish this was to draw out the vines first. That way I could see the composition as a whole. I could see how the vines create the flow through the space and where each leaf needed to fall to finalize the space. This includes taking the vines up the walls, seeing where they should start and stop, how many directions the vine should travel in certain areas to fill those spaces, and so on. Next we took construction paper and made a couple variations of individual leaf sizes that matched the leaves in the painting on White’s wall. Then we took those variations and laid them out one leaf at a time. We paid close attention to how each leaf would fill and affect a space. We knew in what vine areas we wanted to have more or less congestion. Next was a matter of amplifying the congestion. This is not a fast process. We drew out a couple of leaf areas, stepped back to observe, and then repeated the process. When I paint a composition on a canvas I have to step back often to make sure I can see everything as a whole. It is a lot harder to do this with 900 square feet of concrete but it can be done. After feeling like we answered every layout question possible, we engraved our design with a small angle grinder. The wider blade and the small hand tool allow us to cut and shape or curve quickly and easily. Then the staining began. I decided that the vines would be the darkest value, leaves the middle value, and the negative spaces very light. We used Kingdom Products Black acid stain for all three types of space, diluting it more as we worked from the darkest to the lightest areas. All the vines and leaves were hand-stained with brushes. Once that was done we lightly sprayed Rustic Tan and a diluted Black acid stain, randomly, on the entire area to add a little warmth to the cold brown-black coloring. Although the Rustic Tan is barely noticeable to the naked eye, we felt it was extremely important in bringing extra depth through color to the space. After achieving depth through limited acid stain colors it was time to add the most important details. Remembering that acid stain is so permanent, this last color was extremely stressful. We decided we needed shadows throughout the entire design. After hours of drawing shadows over and over to achieve the consistent appearance of a moment in time we stained all the shadows with a full-strength Deep Walnut acid stain from Kingdom Products. Although this color is very close in value and tone to the Black acid stain, it was just warm enough to create a separation between the vines, leaves and ground. We had engraved all the lines for the vines and leaves. The shadows, however, had no engraving. We hand-brushed every shadow carefully. Staying inside the lines we drew was a lot harder than hand-brushing between two engraved lines. The shadows had softer lines than all the engraved lines we had already cut. Through both their color and the softer lines, the shadows helped separate the vines from the ground color, and the vines quickly began to appear as if they were floating on a two-dimensional space. Masking can make a stain bleed, especially on a sandpaper-like finish. I trust my ability with a brush over masking. I wanted a soft edge. I had to be careful to not add an excessive amount of stain so it would not puddle and start to bleed. We had to just take our time and slowly paint each shadow. Slow for me is an hour. For almost anyone else it would be an entire day. Finally we sealed everything with two coats of Kingdom Products’ Regal Gloss. Not only is a custom design like this a great collaborative process, I can also feel confident that it will last a very long time. Using acid stain for longevity might focus my color choices down to very few, but in the long run I created a long-lasting, one-of-a-kind design. Jobs like this do not have a quick turnaround time like dye-and-seal projects or stamping concrete, but to me it’s worth spending the extra days working on a project to achieve a moment in design, and I believe this becomes a clear asset when collaborating with my team and my clients. Client: Leo White, Mt. Juliet, Tenn. Scope of project: A private residence's back patio, comprised fo 800 square feet of concrete and two sitting walls that were added to an existing 150-square-foot patio.